In my business, I encounter a lot people looking for relief from pain caused by inflammation – people suffering from conditions like arthritis who are at the end of their ropes, desperate and fed up, ready to take drastic measures like surgery. To these people, I say: don’t lose hope. Three years ago, a client of mine brought in her husband who had recently been diagnosed with stage 4 osteoarthritis in his knee, which severely reduced his mobility and lifestyle. He’d been in pain for years, and had already had multiple surgeries. The diagnosis was the last straw. This outgoing man had led an incredibly active life doing yoga, weight lifting, running, biking, and sailing – just to name a few – but his pain wasn’t allowing him to do the things he loved anymore. In fact, he was beginning to think he’d never get to do them again. Slowly over the next few months we began to see improvements in his knee as he gradually moved away from eating high carbs to mostly protein, vegetables and fruits – following the Paleo diet I prescribed. With an increase of omega 3s in his diet, his inflammation decreased, allowing the exercises I was teaching him to strengthen his knee without causing pain. In adapting to the Paleo lifestyle, especially the physical and nutritional aspects, he was able to regain freedom of movement and continue doing the activities he loved pain free. Of course, my client is not alone. For many of us, joint pain is just another accepted part of the aging process. “I’m getting older,” we make excuses. But it doesn’t have to go that way. Over the years, I’ve seen many clients reduce and completely get rid of joint pain when they change a few things in their diet. In doing so, they address the cause of their pain and not just its symptoms. As you may know, inflammation is a normal immune response that happens when your body secretes injury promoting chemicals to fight off germs and rid itself of damaged cells. Once the wound is healed your immune system ideally settles back down, its job completed. But this is not always the case. Though many factors are involved, one factor to seriously take into consideration is diet. Dietary imbalances can confuse the body into thinking that it is under assault and can cause the immune system to stay active. This continued immune response, often brought about by stress or dietary imbalances, can result in chronic inflammation, which may be responsible for the pain in your joints. As with my client, his high carb and omega 6 intake prevented his immune system from completely settling, and therefore created the inflammation that caused his chronic knee pain and prevented him from being active and living his life freely. What are the dietary imbalances you may be experiencing? As it turns out, the ratio of omega 6 to omega 3 essential fatty acids in your body can greatly affect your levels of inflammation. Well, omega 6 fatty acids are pro-inflammatory, and thus increase inflammation, while omega-3 fatty acids are anti-inflammatory, meaning that they reduce inflammation. 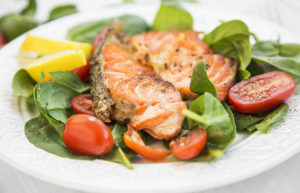 Therein lies one of the secrets to reducing inflammation: increasing your intake of omega-3 fatty acids and decreasing your intake of foods with high levels of omega-6 fatty acids. It’s so simple: increase omega 3s and decrease omega 6s. But why are omega 3 fatty acids so important? Let’s take a look. Omega-3 fatty acids are the single most deficient nutrient in our diets today. Not only can insufficient consumption of omega-3 fatty acids lead to increased inflammation, but it can also lead to a number of debilitating diseases such as heart disease, cancer, and arthritis. How has our modern day diet become so omega 3 deficient? Prior to the development of agriculture, our ancestors used to eat low-carbohydrate, protein-centered diets. However, with the introduction of agriculture, consumption of vegetable oils (soybean, corn, safflower, and sunflower) and grains, both high in omega-6 fatty acids, became much more common. Also, as we began to raise animals commercially, the majority of natural, grass-fed meat was replaced with grain-fed meat, the latter of which can increase omega 6 levels. In conjunction with these dietary changes, the average omega 6/omega 3 ratio increased from 2 to 1 (the ideal ratio) to roughly 20 to 1. It’s simple and totally achievable with just a little attention to ingredients in the foods you consume. Decrease your omega-6 intake. You can begin by eating natural, grass-fed meat instead of grain-fed meat. As well, by avoiding cooking with vegetable oils and consuming fried or processed foods such as crackers, cookies and breads, (which often contain vegetable oils) you can significantly reduce your omega-6 intake. Increase omega-3 intake by eating cold-water seafood such as salmon, mackerel, black cod and herring, all of which are rich in omega-3 fatty acids. Eating grass-fed beef, lamb, buffalo, walnuts and dark leafy greens, and taking fish oil supplements can further boost your omega-3 levels. In the long term, these dietary changes will help to decrease joint pain and stiffness, accelerate your recovery from injury and improve your overall mobility as it did with my extremely active client. They will also reduce your risk of developing various diseases and help you to age gracefully. All of these benefits will go a long way in helping you to look and feel healthier. For more information about how to rid your body of inflammation, click here to request a no obligation consultation today!